What is Service-Learning & Community Engagement? Service-Learning engages students in weekly service with a designated service placement. Through this sustained partnership, students build relationships with whom they serve. Service-Learning also allows students the opportunity to engage in formal and informal reflections on their service, which allow students to connect their service with their learning. 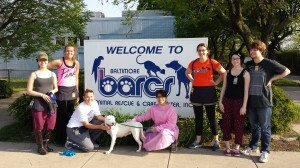 Service-Learning is a connector program for various Shriver Center and UMBC initiatives. The 096 Community Service & Learning Practicum allows for students to engage in weekly service and reflection through the enrollment in a zero-credit, pass/fail course. In FY18, The Shriver Center coordinated over 900 placements with close to 60 different community partners. Staff work closely with students to choose their service sites based upon their passions, goals, interests and availability. Currently, the Shriver Center has community partnerships with organizations that focus on various issue areas that serve diverse populations. These include, but are not limited to, animal welfare, education, the environment, food and housing access, healthcare and mental health. If you are interested in incorporating Service-Learning into a current or future academic course, please set up a meeting with a Shriver or Service-Learning Staff. If you are interested in having UMBC students volunteer with your organization, please look over our Community Partner Packet. Contact Service-Learning Staff to discuss existing and future partnerships.